This morning when I first checked my phone for new emails, I noticed that Etsy had an article on the newest trends in vintage decor. 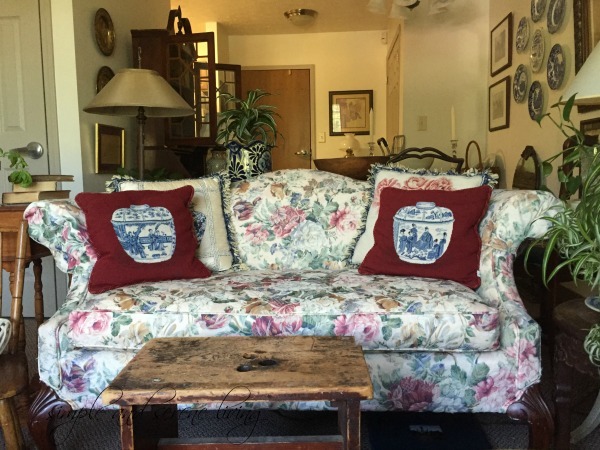 The first one they talked about was florals including pillows, and chintz. Not only do I have floral pillows, but I have a full on chintz setee. Wow, I thought, who knew I was so trendy. My sister, who is into fashion, the way I am into decorating with vintage and antiques said I have always been like that. A compliment that I can live with. Blue and white china is also trending, and I certainly have a ton of that. and as wall decor among other things. 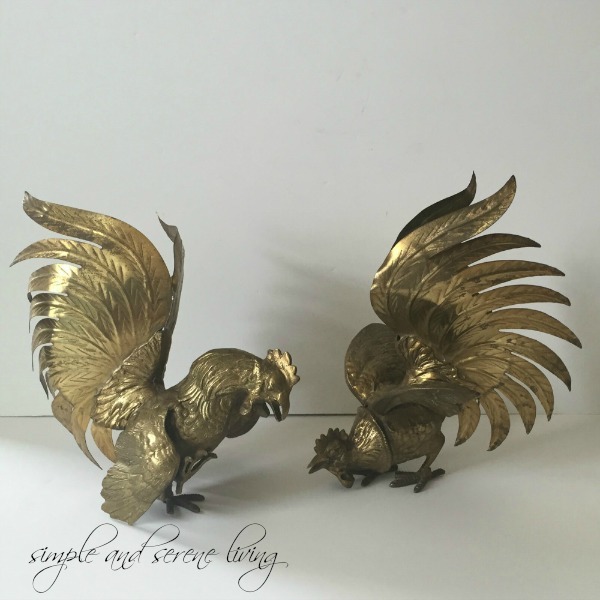 Another trend is brass figurines and I happen to have those in my Etsy Shop. 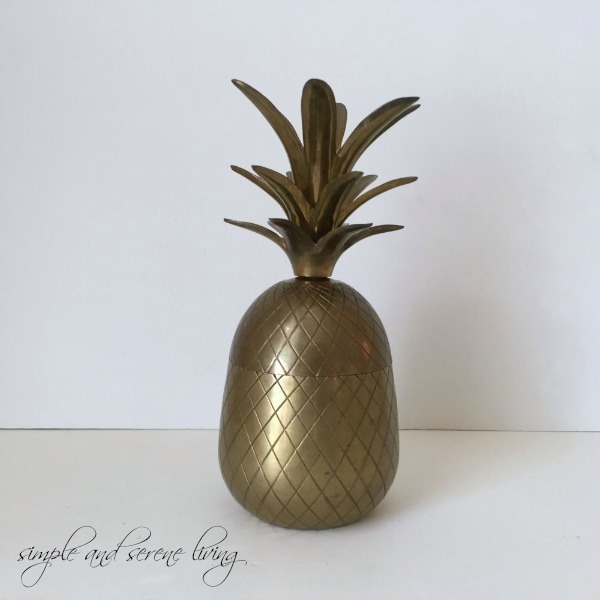 to a beautiful brass pineapple container. About this trendy thing. I think trends are all well and good, but in all honesty I just decorate with what makes me feel good. I want to feel comfortable and at home where ever I live. I think that is what is most important. How do you feel about trends. 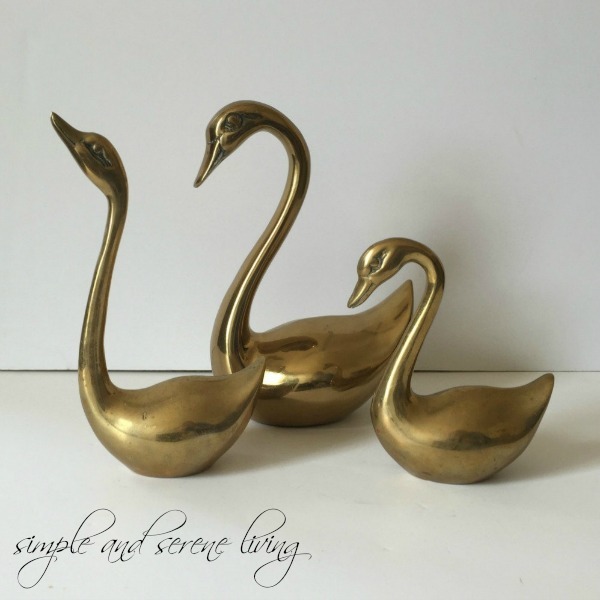 Do you love following the latest ones and changing up your decor a lot, or are you more like me and love how you decorate no matter the trends. I am not trendy. 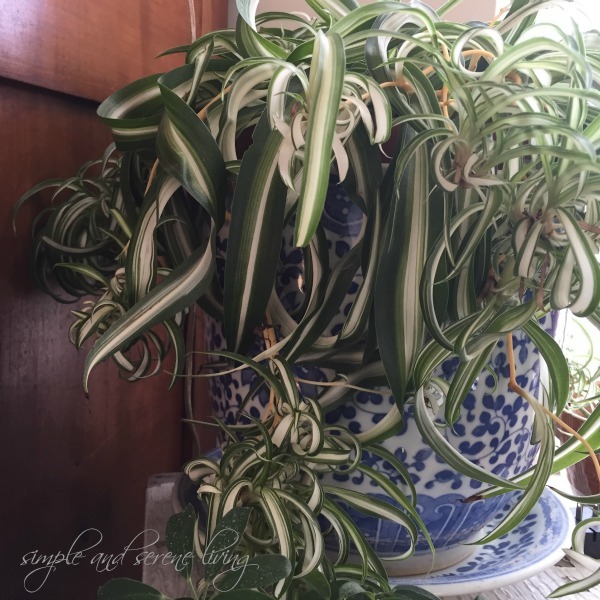 I do enjoy seeing the latest trends, but my home is so eclectic with lots of vintage pottery, a mix of furniture styles and way too much clutter to ever be stylish! Your home looks like the décor I see in the English blogs I follow. I especially like the needlepoint pillow! I'm not at all trendy, but having put my house on the market I do have to try to pare back on my own style preferences. I am exactly like you ~ I follow my own heart when it comes to decorating and fashion too. We love the same things. I will never, ever, tire of chintz and blue and white transferware and brass too. Give me a sweet English cottage and a cup of tea and a good book any day! 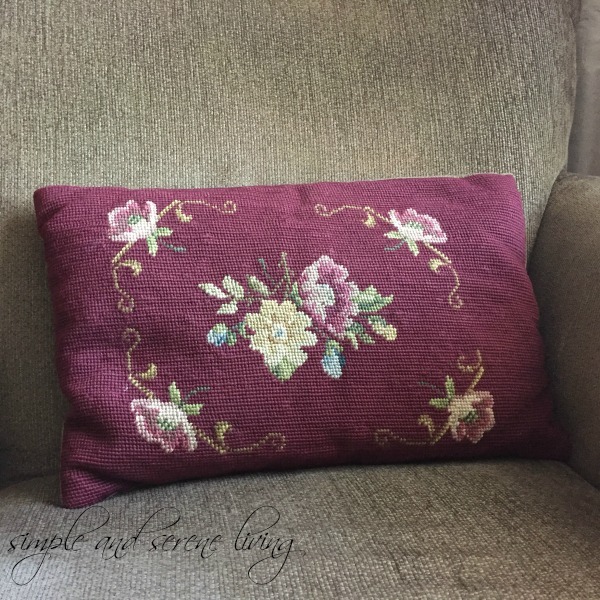 PS: I have a needlepoint pillow on my blog post today too. Just adore needlepoint and love yours too! You did a great job on that wall of plates! Nah, I don't tend to like trends much. Like this shiplap. Don't much care for it. I detest the colors gray and pink. I hate pallets (and I think there are chemicals on them), and everyone knows how I feel about stainless steel appliances. Reminds me of the morgue I used to go to when researching articles. your new home looks happily settled now. Enjoy! I can say that I don't follow trends. I just follow my heart and buy what I enjoy. I LOVE your cozy decor. 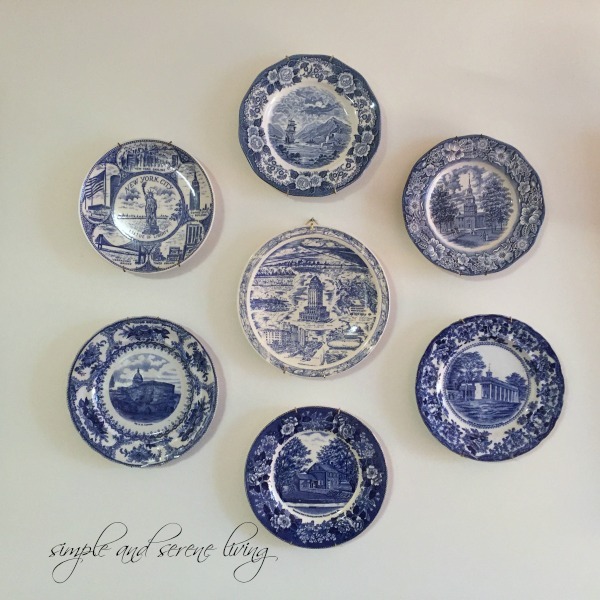 I have always decorated with vintage decor and repurposed items. Always been into florals and the colors pink, white, green and cream. I'm not a trend follower either. Like you, I go with what makes me happy. Your home is lovely. I love your sofa. I had to laugh, Laura because I delete those Etsy mails as soon as they come in but I did remember the header. And there you are, all trendy and with it according to them. It's nice to see some of these things becoming popular again. Although, the brass items are still not something I care for. I grew up with them and they remind me too much of the 80's decor.